Silliest fine print I have ever seen. In the email, a coupon for 25% off any item. HUH? Didn’t you just tell your email list recipients that you had to make room for incoming? Why would that 25% off coupon NOT be usable on sale merchandise? Isn’t the sale stuff the stuff you MOST want to get rid of? 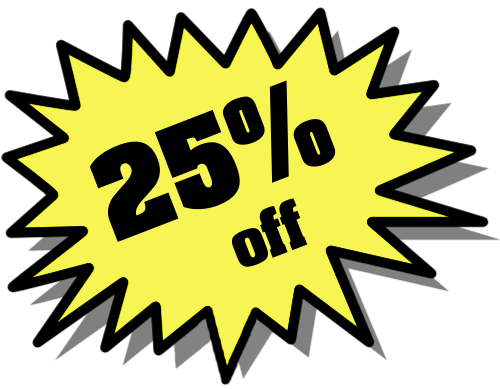 And wouldn’t you MUCH rather give an additional 25% off on a winter item marked down to $5 (discount taken: $1.25) than 25% off a new incoming item of, say, $40 (discount taken: $10)…if that’s how your customer wants to use her coupon? Yes, 25% off anything. Well, except maybe my kid and dog. I love the *Items with no tickets are $300!! When we do our Facebook Give-aways one of the rules is “you must be awesome to win”. I do agree with Julie though, its a good reminder of the math behind the coupons! Here’s some fine print that made me laugh. Thank you for pointing this out. I have said discount not available on sale items before thinking they are reduced already why give them away. You really helped me remember why I mark things down – to move them out. And you showing the math really helps understand why I would want it used on a sale item, rather than a new item.